The Ion Age Blog: Prang Army Platoon and packs released! 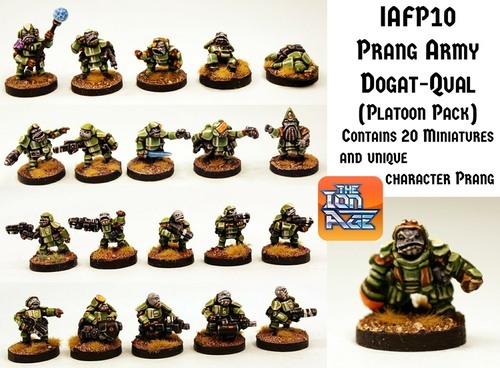 Prang Army Platoon and packs released! Welcome to the releases for July 2017 at The Ion Age and thank you for your kind words at our first look at the Prang Army expansions last week. Now on the website are two more packs of Prang Army to add to your collection and a platoon pack containing one of every pose and an additional miniature only found in the platoon. Go HERE or read on for more information. Additionally if you missed last week's article you can read it HERE on our blog including a tale of Prang and Human war against the Shia Khan Empire. Here are the new codes sculpted by the creator of the Prang the talented Eli Arndt. We hope you like them! The specialist poses for your alien Prang Army. These miniatures are standard bearer, comms, medic and casualties. This code contains five different white metal 15mm scale poses all wearing ceramic armour. From left to right these are the Tov Hadak (Water Bearer) who act as a standard bearer with a tank of home world water on his back and a ceremonial beacon pole which sings to Prang all around. Then a Tov Communications Trooper with Blaster Carbine, a Grox (Medic) with visual amplified. A Prang Tov injured and reclining. A Prang Tov deceased face down. These detailed miniatures are the height of a Human (around 17mm though they do go up to 20mm for the bigger Prang) but are much bulkier. This code can be bought as a pack or as single miniatures or three packs saving 10% off list. Chose your option from the drop down menu on the page. Price per pack is 5.00GBP. The officers and notables for your Prang Army. These miniatures are Sarga's (officers and sergeants) as well as a Prang Army Tech and an Army recruited Sherag. This code contains five different white metal 15mm scale poses wearing ceramic armour and robes. From left to right these are a Letat (officer) with Blaster Pistol, a Sarga with Blaster Rifle, a Sarga with Blaster Pistol and Vibro Blade. Then a Prang Army Tech with visor linked scanner and Blaster Pistol. Lasty an army recruited Sherag an advisor in robes and ceramic plate with concealed Blaster Pistol. These detailed miniatures are the height of a Human (around 17mm though they do go up to 20mm for the bigger Prang) but are much bulkier. This code can be bought as a pack or as single miniatures or three packs saving 10% off list. Chose your option from the drop down menu on the page. Price per pack is 5.00GBP. An entire Dogat-Qual or platoon of the Prang Army which operates in platoons made up of squads typically of five. This platoon pack contains 21 white metal 15mm scale miniatures of the alien Prang. Twenty different poses including five command, five leaders, five support and five troopers. All are wearing ceramic armour and carrying Blaster Rifles, Blaster Carbines and Pistols as well as more exotic weapons such as Arc Cannon and Sonic Stunner. These miniatures are from pack codes IAF129,IAF130, IAF137 and IAF138 see these for additional details. This platoon also contains one additional free miniature which is unique to this code and that is a Prang character who can be used as who could be anything from an officer to a pilot or vehicle crew, trooper or technical support worth 1.00GBP. This platoon can be purchased as one or using the drop down menu select three packs and save 10%. If you want great aliens for your games then get some Prang! Price is 20.00GBP per pack. Go HERE for the Prang on the website and here follows the Prang Army codes already released in the autumn of 2016. The core fire team for your alien Prang Army. These miniatures are typical troopers with a variety of poses all with Blaster Rifles. This code contains five different white metal 15mm scale poses all wearing ceramic armour. From left to right these are Prang Trooper with servo assist Blaster Rifle, Prang Sergeant with Blaster Rifle arm raised, Prang Trooper with Blaster Rifle advancing, Prang Trooper aiming Blaster Rifle and lastly Prang Trooper firing Blaster Rifle. These detailed miniatures are the height of a Human (around 17mm though they do go up to 20mm for the bigger Prang) but are much bulkier. This code can be bought as a pack or as single miniatures or three packs saving 10% off list. Chose your option from the drop down menu on the page. Price per pack is 5.00GBP. The heavier weapon fire team for your alien Prang Army. These miniatures are typical troopers with a variety of weapons. This code contains five different white metal 15mm scale poses all wearing ceramic armour. From left to right these are Prang Sergeant with Blaster Rifle pointing, Prang Trooper with Arc Cannon and visor, Prang Trooper with Blaster Focus Cannon, Prang Trooper with Heavy Auto Cannon and lastly Prang Trooper with Sonic Stunner firing from the hip. These detailed miniatures are the height of a Human (around 17mm though they do go up to 20mm for the bigger Prang) but are much bulkier. This code can be bought as a pack or as single miniatures or three packs saving 10% off list. Chose your option from the drop down menu on the page. Price per pack is 5.00GBP. A civilian or freebooter character for your Prang collection. 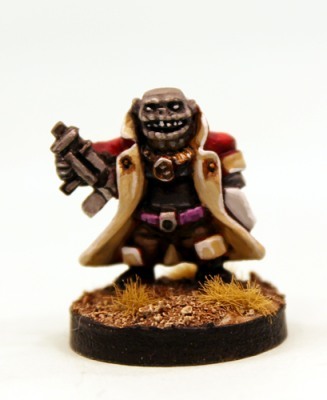 A formerly free miniature of the month in the Year Four Collection as of August 2017. Known as Ambassador Throaq of the Prang this alien is a friend and ally to mankind in the war against the raiders and the Shia Khan Empire. Stands approx 20mm tall. Price is 1.00GBP. Go HERE for the Prang on the website. Free in every order every time all month. This miniature is automatically put into every order at the rate of one per order regardless of order value. It can also be bought in any amount on the monthly IMP page of the website for this month only too before being withdrawn on the first of next month. You can see the Year Three Collection on the website. The Year Four Collection will be released in August and will mark the end of the monthly free programme at that time; there will be no more monthly miniatures after August 2017. The Rewards Programme will remain. Standing 10mm tall the Bin Bot is a functional robot created for collecting waste from the food stations of Happy Burger. It joins the waiter, vending and entertainment bots. 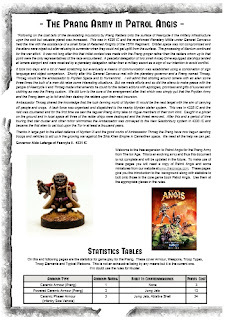 There is a near complete page on the Ion Age website where the current and all former IMP series free miniatures are shown so that you can see what came before. This miniature is worth 0.60GBP. This month we have 25% off the great pack IAF113 Xin Trade Fleet Rifles. This offer ends on 1st August. Just add to cart and it is the pack plus single poses from it to which the discount has been applied. Check out all of the Xin Trade Fleet on their page HERE. We have no further releases this month but we will be putting out two updated free PDF files for Patrol Angis which cover the use of the Prang Army and the Xin Hegemony in the game. We will be adding infantry size vehicles and larger vehicles to the existing files. All working towards the continued growth of The Ion Age.